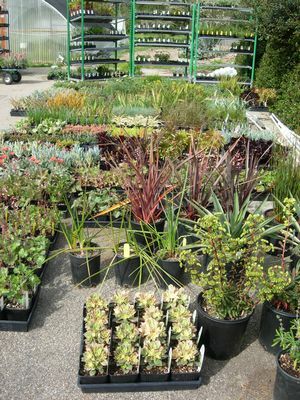 We're a small nursery, locally owned and operated, in Soquel CA (just outside Santa Cruz). We specialize in water-wise plants and plants that provide food for birds, butterflies and beneficial insects. We're passionate about plants, the environment and love sharing our knowledge and enthusiasm with our customers. Read on if you'd like to learn more about our plants, our growing methods and the nursery ..... or come visit us at the nursery or one of the events we go to. We'd love to see you! Our main focus is growing plants that are water-wise and/or provide food or habitat for birds, butterflies and beneficial insects. We take great care to ensure none of our plants are invasive. We aim to grow a wide range of plants that'll do well in the greater San Francisco and Monterey Bay areas, California's Central Coast and Silicon Valley. If you live outside these areas, we're sure you'll still find something to grab your attention though! To love what we do and have fun doing it! Gold Rush is a fitting name for the nursery because many of the plants we grow are from regions that were, or still are, gold producers - California, South Africa and Australia. We actually named the nursery, though, for our dog, Java. Gold Rush is the line of golden retrievers she was from. 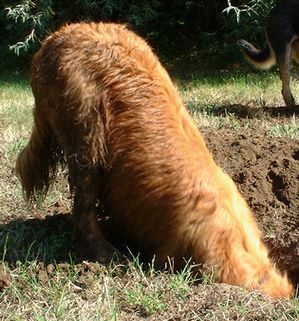 Java had shovels for paws and loved to dig for gophers. She was always wet and dirty, LOVED hanging out in the nursery and was our chief meeter-and-greeter! Sadly she died from multiple myeloma (a form of blood cancer) in 2011 L .
We now have another golden meet-and-greet girl - Sera (short for Moonlight Serenade because she likes to bark at the moon!). Just like Java, she's always wet and dirty! We try very hard to be careful stewards of the environment in everything we do at the nursery. As far as pesticides are concerned, we want the nursery and our plants to be safe for our workers, customers, pets and wildlife. We don't use any synthetic pesticides and use only the bare minimum of organic approved pesticides when absolutely necessary. Even organic-approved pesticides can be harmful to wildlife and humans. We don't use any herbicides (weedkillers) at all. Instead, all weeds are pulled lovingly by hand!